It was only during my teacher training that the concept of foundation sunk into my heady head. Repeatedly it was a drill embedding deeper and deeper until ‘ding-ding-ding’, the Big Ben clamoured, and the duh was finally replaced with aha! Yes, in our teacher training, we discovered numerous aha moments including mOMents. Tadasana, Mountain Pose, Samastithi for other practices, the pouring of cement into a structure to achieve the steadiness. Now note that there is a difference between stability and rigidness. I find that there are more practitioners who exhibit rigidity in their poses. Even in Tadasana. This defeats the fluidity we all have within us. It suppresses the suppleness we need allowing our practice to deepen. We create this robotic structure ‘thinking’ that getting it done is the way; while we have forgotten that it is in the way of how it is done. Stability by defintion is maintaining equilibrium. Balance. Much like a pendulum swaying as it tick-tocks, yet holding its rooting with the clock. I remember one instructor who encourages us to sway side to side with our eyes closed while in Tadasana. Only when we have created that stability will we be able to tame our thoughts. Taming our thoughts calms the fear. Calming the fear creates the comfort in your foundation. Fear reflects a lot of things. Anxiety breeds nervousness resulting to wobbliness. Panic in the unknown stirring hidden emotions. Doubting one’s own limit to explore our body’s capacity. Worry over the result when it has not even began. Fear is a whole mirage of tentacles surrounding our core, gripping the natural spontaneity of our practice, inhibiting the strength of our foundation. Practice Tadasana while waiting in line. Practice Tadasana while driving your car. Practice Tadasana while walking your dog. Practice Tadasana while laying down. Practice Tadasana while reading this!! My massage therapist recently told me… “When you keep doing it, eventually your body will simply be in the correct posture all the time.” Even from an awkward position, when you stand up, you naturally do so without inhibitions. … lifting your toes up ensuring the four corners of the soles of your feet are rooted. This is a good way to stretch the toes and open them up. I view the toes as the roots, gripping the mat in your practice. 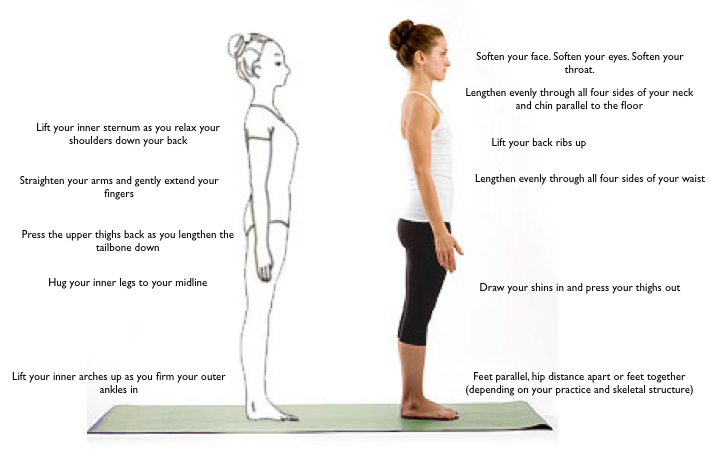 … lengthening the tailbone down is a circular motion where your front rounds up to bring the pelvis up. Most practitioners mistake bringing the tailbone down by pushing the pelvis forward. This creates a Swayback Postural Alignment and other haywires happen with the rest of the body. As you feel your pelvis or pubic bone go forward, curl up that area towards the belly as you bring your navel towards the spine. This motion gives length. And yes, you will feel certain parts from that area stretch. That’s what we want. … a good way to roll the shoulder bones back is to hunch your shoulders towards the ears and rotate them back and down. Not all people can access the widening of the collarbones simply by pushing the shoulder blades toward the back centre. This is something like Step A straight to Step Z. Again, get to know your body. When you feel you need to go through the whole alphabet to get to Z, then by all means do so. Our differences in our bodies do not make any of us weaker. We are simply uniquely different. As the cues are given in class to achieve Tadasana, it is also a spice to add that in every asana, we maintain Tadasana. It is the template for all the poses. For many, simply standing still can be a challenge. Tadasana I feel is forgotten, to easy, silly … Seriously – How hard can it be to stand still, to surrender to yourself, find intention in your breath?